Whether you’re in a flat or your own home, the water coming out of your kitchen tap can be filled with impurities and chemicals; especially if you live in highly-populated or urban areas. That’s why it’s important to keep your drinking water clean, healthy, and clear with a PRIMATO Countertop Water Filter that helps remove a big list of chemicals and impurities. This advanced filtration system installs quickly and easily and helps to improve both taste and quality of your water. And because it uses a premier water filter cartridge that can be replaced every year, as well as a diverter that lets you use the faucet regularly, you’ll love how simple it is to get clean water and still use the sink with ease. Cleaner, Healthier Water – This water filter helps remove a wide list of chemicals and pollutants from drinking water. It is placed on the kitchen counter and connected to the kitchen faucet in 1 minute without tools and without the help of a plumber. Convenient Diverter Switch – Each countertop water filter also features a “switch” (diverter) that lets you quickly and easily toggle between filtered water and standard faucet use. The installation is easy and it takes just a few minutes. Watch the video we prepared for you on the Video tab. 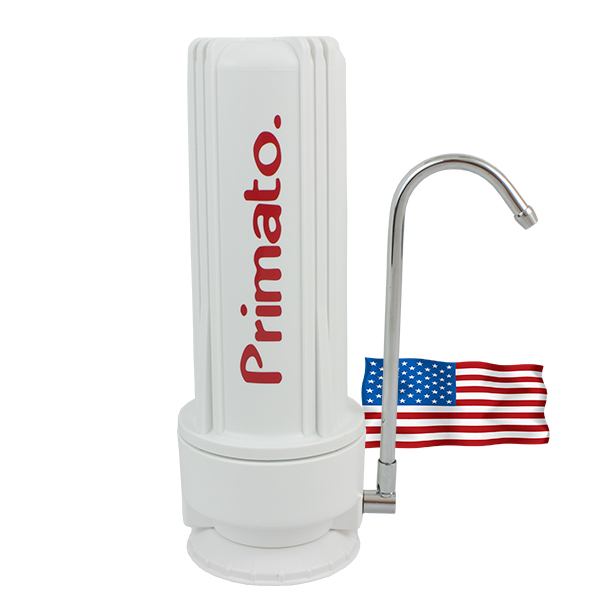 Save Money, Reduce Waste – Along with improving water taste and clarity, PRIMATO COUNTERTOP WATER FILTER reduces the need for spending on wasteful plastic water bottles. 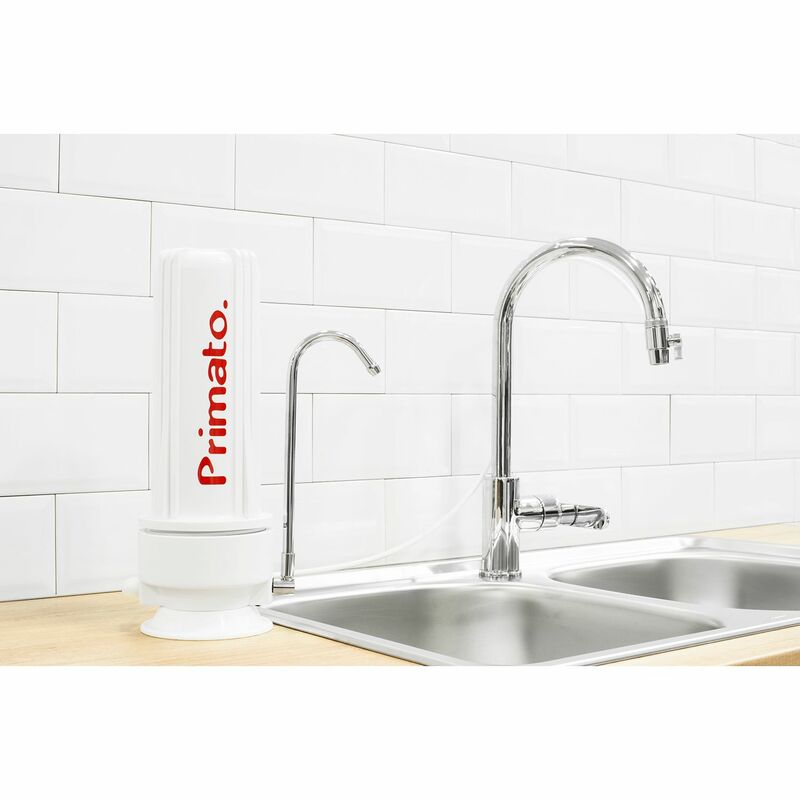 Quick Countertop Installation – PRIMATO water filter kit comes with everything you need to install it by the kitchen sink while taking up minimal space. It can connect to most faucets except the ones with a shower head. If you have such a tap (with a shower head), you should install a water filter under your kitchen sink. Price includes the Primato ULTRA CTO activated carbon block filter - made in USA. Below you can read more info about this cartridge. You can select a different cartridge for this water filter. The price will automatically change depending on your selection. It includes a wrench to easily change the replacement filter once every year. Trusted Warranty – PRIMATO water filters are backed by an unbeatable guarantee for quality assurance and a manufacturer’s warranty (10 YEARS) to protect against control issues. The filter faucet has a 2 year warranty. Is made in the US. It should be replaced every year. Good for 22,700 liters of dechlorination. Permeability: 5 microns. This means that water tries to pass through holes with a diameter of 5 microns. To give you a rough idea of how narrow these holes are, human hair has a diameter of 100 microns. It reduces chlorine and chloroform, suspended particulates, sand and rust, sludge, mud, total organic carbon, industrial organic compounds (tetrachlorethylene, trichlorethylene), dissolved organic compounds, organic paint, dissolved iron, manganese and many other harmful substances. It greatly improves water's taste and odour. It keeps the necessary minerals and trace elements. It is certified by NSF International (USA). 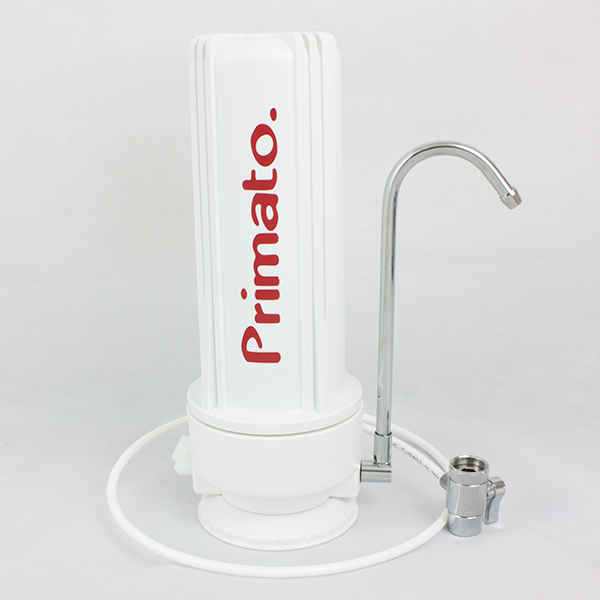 Get PRIMATO COUNTERTOP water filtration system today by clicking ‘ADD TO CART’ above and start improving the drinking water in your home today.